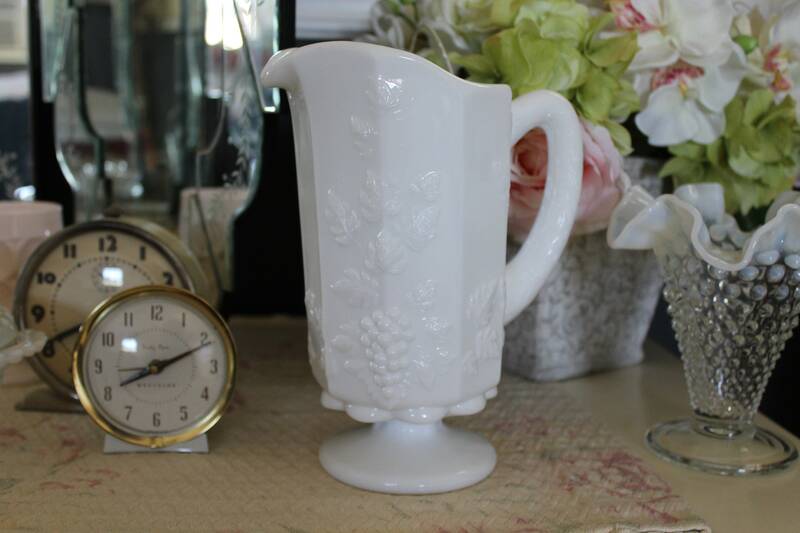 This vintage milk glass pitcher is thick and heavy. It is made out of dense, creamy white milk glass, not skim milk glass. It is in the paneled grape pattern with a textured handle that mimics a branch. I believe it was made by Westmoreland. This white glass pitcher would look sweet in your white farmhouse kitchen or Victorian dining room. A perfect bridal shower or wedding pitcher. It is in excellent vintage condition. Please use your zoom for a good look. It holds about 2 1/2 cups or 20 oz.